Quick question, your concept of keeping extra players… how do you effectively swing it? I love the concept, but the parents demand playing time for their kids… especially when you are winning, or if they think the child is much better then player X.
I would love to keep a “Rudy” type player. Someone who loved the game, worked hard in practice, filled in when it helped, was a great team player etc…but they don’t exist anymore. I am not saying I would have any player not get some time, but at the High School and High School Club level, the demand for “equal” playing time from parents is a real problem. In Club, I carry 17 players were I used to carry 20 or 21 (especially at club were the parents’ complaints could be magnified by the travel costs, etc…). In addition, the players I would like to keep to help us be a little deeper are often not happy with that role. They (or their parents) often become a distraction. An environment is then created were parents are actually hoping starters don’t do so well, so they can demand time for their child. It is a real cultural problem in sports. My only solution has been less numbers means everyone is even more valuable to the team. Any advice? Great questions!!! 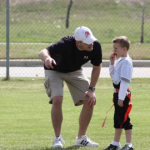 I am excited when our youth coaches put so much thought and time into doing what is right and best for the kids. Thank you for being that kind of a coach. Your parents and kids should be thankful for your commitment for their best. Playing time will always be an issue, and will always be a challenge to effectively swing. When parents pay the hefty price for club ball, they expect their kids to get good playing time, as they should. I have been in that situation many, many times both as a coach and a parent. My kids have at times been the best on the team and the worst on the team, bringing the experience to a personal level. It is important that you only carry the amount of players that you plan to play, and work into your rotation. Once you have your team, your first meeting must be with all parents and players defining your playing time policy. At this time give them the option to stay on or find another team, communicating that after that meeting, playing time issues will be a mute point. 1. You can carry a few more kids as “alternates” with the idea that they were close to making the team, and they can practice with the team as they develop their game. They must know that they will not play in the games. This will take away that expectation and yet give hope for the future as they still get to practice and be a part of the team. 2. You can put together another team. I would let this “B” team practice with the “A” team. Again, you are creating an atmosphere where they still feel a part of your team/club. In this option, the kids still benefit from your coaching. The challenge here could be in finding a coach to help out with that “B” team, especially for the games. 3. The third option would be to help them find a new/different team. Although this could be the hardest to suggest, it many times is for the best of the kid. 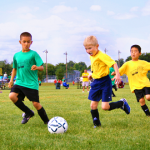 Playing time will always be an important component for the development of the kids, so a carefully thought out plan and function is crucial. Thank you again for your desire to be a coach with a positive impact!! !